Teacher Chen at a tournament. Her favourite player is Lee Changho. Chen Qianwei was born in Guangdong, China. She has been playing go since she was seven years old. She became professional at the age of 18 and was promoted to 2p the next year. A Shanghai International Studies University graduate her major is Japanese Culture. She has been teaching both children and adults for many years in Shanghai and is very passionate about her students’ development. Her hobbies are go, traveling and reading. Chen Qianwei's style of play is steady and her role-model is Lee Changho, 9p. Teacher Wu seen here watching over the shoulder of his student Jiang Weijie. 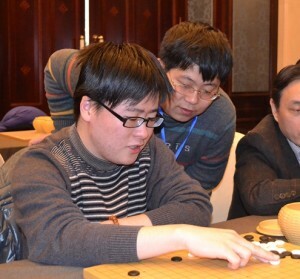 Wu Zhenyu became a professional after winning the National Rating Tournament in 2001 when he was 17 years old. In 2005 he won the National University Students Go Tournament and joined the Chinese University Student team and helped them become world champions. In the same year he was promoted to 2p. Since then he has been working as a teacher both for kids and adults. Some of his students have gone on to be top go players. His students include world champions Fan Tingyu, 9p and Jiang Weijie, 9p. Wu Zhenyu's style of play is fighting and he is well known for his powerful reading abilities. Yao Yun playing go at a tea house. She hopes to help her students increase their love of go. Yao Yun is a strong 5 dan player from Shanghai, China. 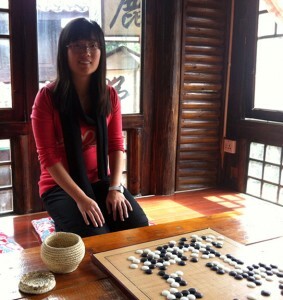 She started studying go at the age of seven and reached the 5d level at the age of 12. 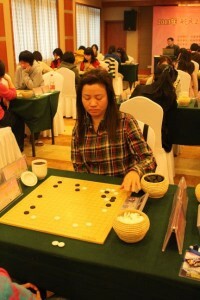 Before going to university she won almost 30 go prizes and she was member of her university team. As she began her university life she started to teach go and has taught many children and adults from all over the world! Now she works at the Hangzhou Go Association. She has extended this message to her students: I hope I can be your guide into the mysterious world of go. I will be so glad if you improve your go level and love go more and more!